In addition to this Sweet tuna jerky, they also market a Spicy tuna jerky that I'll review next week. Yellowfin tuna (wild caught), soy sauce, corn syrup, ginger, black pepper, garlic, red pepper, salt, sugar, sorbitol, alcohol, onion powder, nutmeg, glutamic acid, smoke oil, starch, sodium erythorbate. The first thing I taste from the surface of these pieces is a light sweet that's quickly overtaken by a stronger saltiness. There's also a well-noticed fishy flavor. 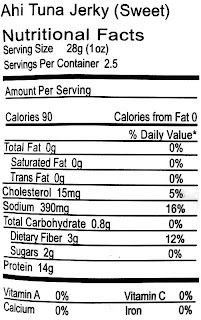 The chewing flavor starts with a strong natural meat flavor of tuna, along with a lightly spicy, lightly tangy, flavor. For being labeled as a "Sweet" variety, there's not much sweetness in this. There's a light sweet flavor when I first put a piece into my mouth, but it's quickly erased by a stronger saltiness. And even in the chewing, I don't really pick up a lot of sweetness. I can still detect some sweetness, but being that this variety is specifically labeled "Sweet", it doesn't really hit that flavor squarely. 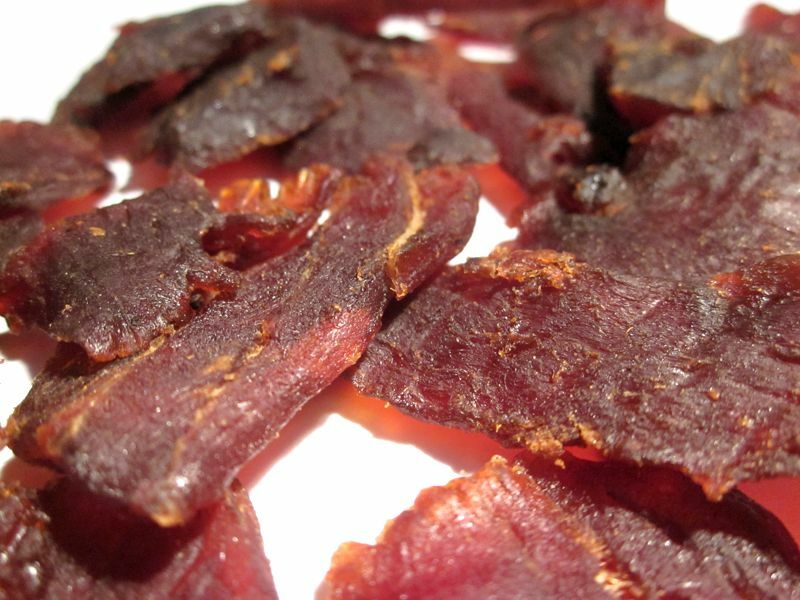 Otherwise, the flavor that seems to dominate this jerky is the natural meat flavors. It certainly has that tuna flavor, and considering Itsumo claims this tuna to be "Japanese Sashimi Grade", I can say that it does actually have a flavor that reminds me of a slice of tuna sashimi. Beyond that, there's a noticeable degree of seasonings, but it's hard to say what it is, or specifically what the seasonings taste like. It's just a light bit of spiciness to give it some zing. The soy sauce listed in the ingredients is also lightly noticeable. But there is a dominant saltiness to this. 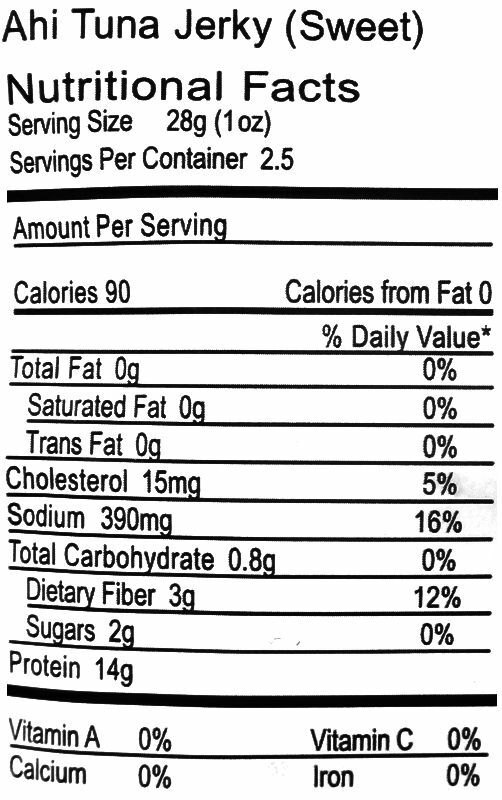 It feels like it sits between a medium and high level, even though the nutrition facts label shows a moderate sodium content. Overall, what you're going to taste in this is mostly the natural tuna meat flavor, similar to what you'd expect from a piece of tuna sashimi, dunked into some soy sauce and sprinkled with some seasonings. You won't really taste much sweetness in this, and in fact it's more salty. This is a dry jerky with dry surface feel. They have a bit of flexibility and are able to bend about 90 degrees before cracking open. The chewing feels quite chewy, though still not that tough. The chewing texture starts out feeling just like piece of beef jerky, more comparable to a Jack Link's, but maybe a tad more dry and tough. They have quite a bit of initial chewing resistance, and take a good deal of chewing to get down to a soft mass. At that point, it has a texture somewhat like tuna sashimi, but more chewy and dry. 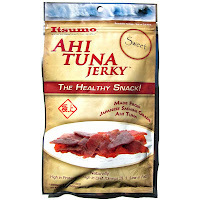 Itsumo sells this Sweet Ahi Tuna Jerky from its website at a price of $6.99 for a 2.5oz package. If you bought six packages, along with a flat-rate shipping of $6.00, the total comes to $47.94. That works out to a price of $3.20 per ounce. As a Sweet Ahi Tuna Jerky, it's also a weak value. First, I don't really see this as sweet, and if you bought this specifically because you wanted a lot of sweet flavor, you won't get a lot. Second, the only other Ahi Tuna Jerky I reviewed is from Alien Fresh Jerky, which is costs half as less, but seems to provide a better snackability. 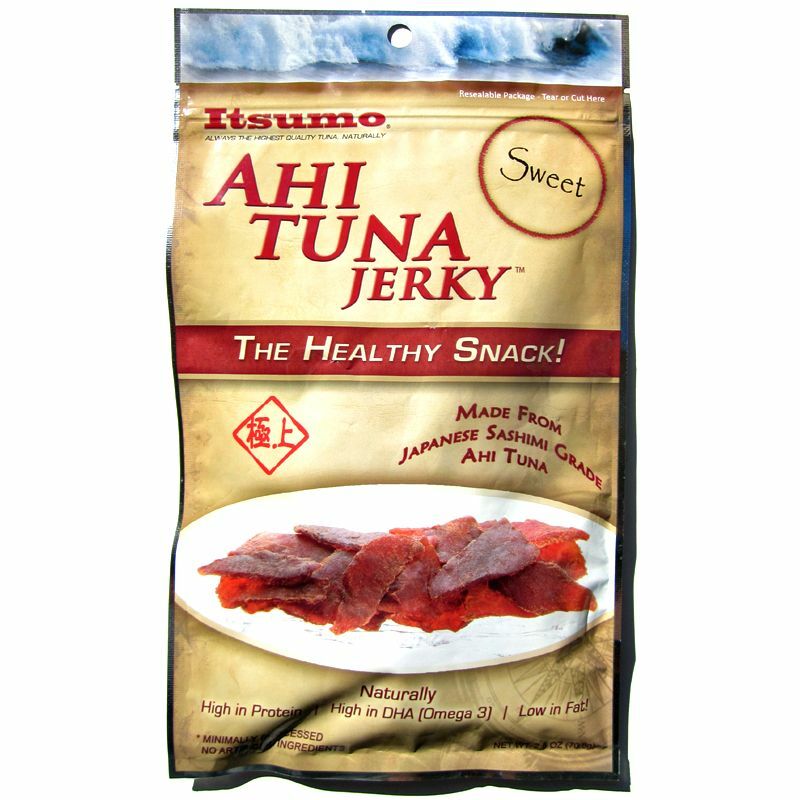 This Sweet Ahi Tuna Jerky from Itsumo manages to provide a flavor that resembles eating a slice of tuna sashimi (raw fish filet), dipped in some soy sauce, and seasoned with some light spices. But considering this is specifically labeled as "Sweet", it's not really so. This jerky has only a touch of sweet initially, and really doesn't deliver much of what it claims. If anything, this is more salty than it is sweet. Even though I'm someone who enjoys tuna sashimi, I don't know if that flavor really and chewing texture works all that well in jerky form. 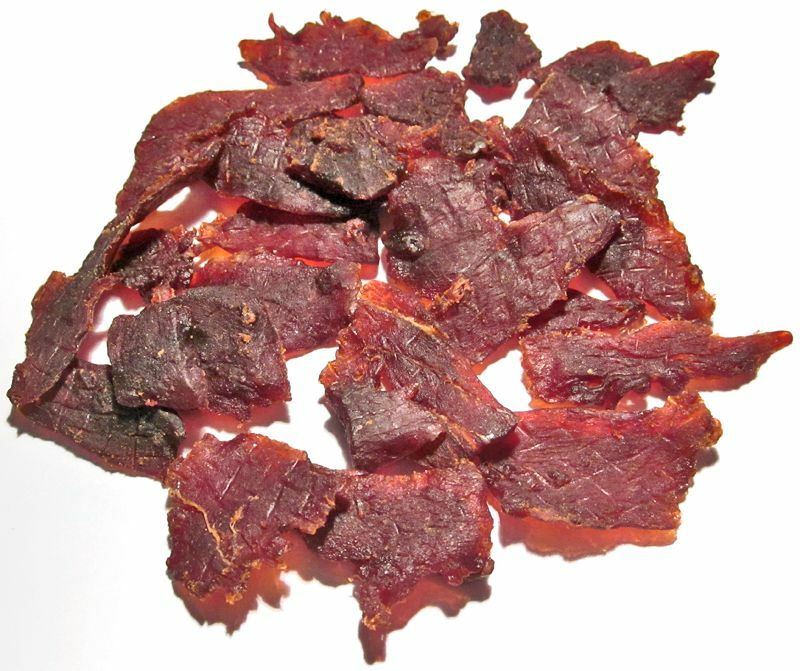 The Ahi Tuna Jerky from Alien Fresh Jerky is actually dried smoked tuna and based on that it seems to work better as a jerky. But this dried sashimi tuna just doesn't quite translate its flavor and chewing texture well into jerky. There's still a fair amount of snackability for its marinade and seasonings, but I'm not finding the flavor exciting enough to push it above average. Itsumo ahi jerky has a new sweet version that is available ton their website @ https://www.itsumoahijerky.com/ plus its way healthier and better quality to comparable "high value" jerky's talked about in this article.